New! Limited Edition NuFACE Mini Facial Toning Device in Caribbean Sea. NuFACE mini Device in Limited Edition Caribbean Sea. Smart skin sensor for customized delivery. Rechargeable battery with power adaptor. 1) PREP: Cleanse skin & apply NuFACE primer. 2) LIFT: Glide the NuFACE mini device over face as directed. 3) FINISH: Remove NuFACE primer with a damp cloth. Ideal for: Beauty Seekers who want to lift, tone and contour, lift jowls, contour jawline, reduce nasal labial folds and wrinkles, lift eye brows, open eyes ... need we say more? NuFace creator and founder Carol Cole began working with microcurrents in 1985, long before the term became a beauty buzz word. Fast forward to today, we continue to spread the word and belief that true beauty emanates from the inside out and that innovative technologies can be used to deliver cutting-edge solutions to improve the skin and overall appearance. That is why we focus our efforts on developing easy-to-use, proven technologies that address the cause of aging and encourage natural regeneration from under and within the skin. In 2005, her company introduced NuFace, a hand-held anti-aging device for at-home use that utilizes optimal microcurrents to lift and tone while reducing the appearance of fine lines and wrinkles. 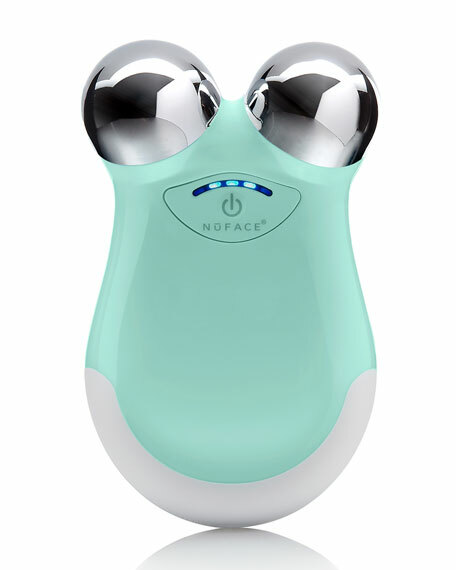 A favorite among celebrities, the innovative NuFace received FDA clearance for facial toning and stimulation. Passionate about delivering great resultsskin which seems to defy aging, NuFACE has been chosen as a beauty must-have to achieve more radiant, age-resistant skin by top beauty and fashion editors from Vogue, InStyle, Elle, Self, Shape, Marie Claire, Harper's Bazaar, and Redbook magazines. For in-store inquiries, use sku #137246.